I know I can sound like a broker record, but fraud keeps showing up in plans. If it is large enough or widespread enough in an organization, we can often identify, flag it, and offer suggestions to stop it. BUT, in many cases smaller levels (that still add up) can fly under our radar. Recently we have seen some providers take advantage of employees and that is the reason we are raising awareness. We hope your staff know better, but don’t want them being involved in an investigation, loss of their benefits, or being charged with fraud, and hope this education will help. A good article on what happens when staff are off for a prolonged absence. This article (and the cases referenced) highlight the importance of precise and consistent wording in employment contracts. Please see the following Bill 47 update – changes to the Ontario Employment Standards Act, 2000 receiving Royal Assent. This provides a quick list of the changes in employment law that will take effect January 1 2019. On November 21, 2018, Bill 47, the Making Ontario Open for Business Act, passed third reading and received Royal Assent. An interesting article on “dependent contractors”. Whether the person(or company) is deemed an “independent contractor”, a “dependent contractor” or a “personal service business”, employers need to make sure that both parties are clear on what they are. Obtaining good advice on the structure they choose is the key to avoiding larger and more expensive problems for both parties. I always see red when I read articles like these. 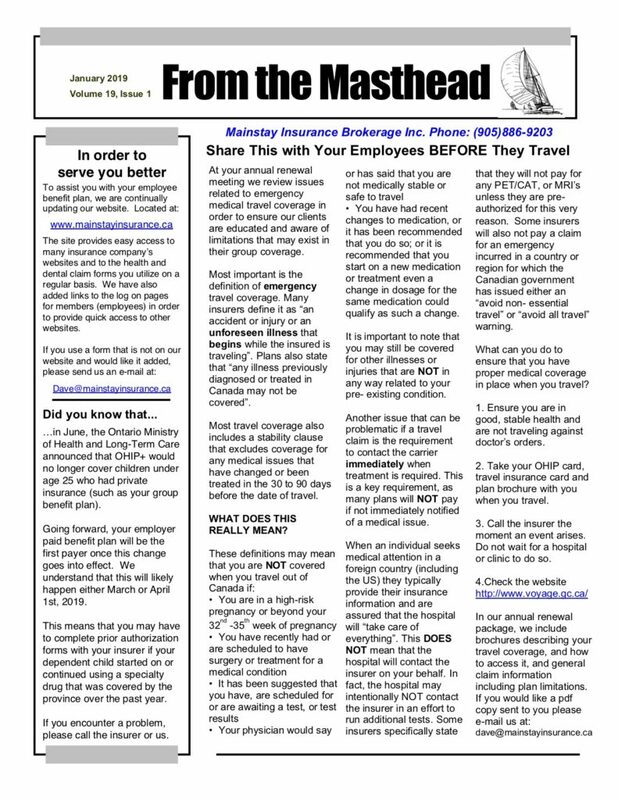 They encourage employee to “use up” their coverage with total disregard to their employer that is paying the bill. Would someone suggest claiming against any other insurance to avoid “wasting money”? Would someone make that minor car insurance claim each year for the shopping cart ding or minor scrape? Likely not, unless you are good with your rates skyrocketing. So why is it okay here? 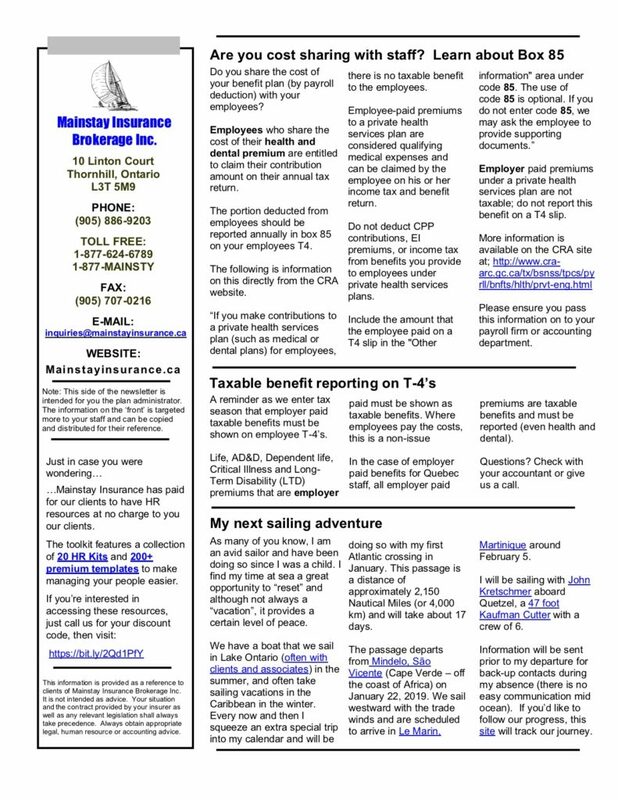 An employee benefit plan is a perq that good employers provide (and should be used that way), not as a way to get more from an insurer (that isn’t really paying). Just a quick note to inform of the increased health tax exemption. Details are below. Effective January 1, 2019, the Employer Health Tax (EHT) exemption is increased from $450,000 to $490,000. This is part of a series of EHT exemption adjustments for inflation using the Ontario Consumer Price Index scheduled for every five years.